The reason for this seeming disparity? A. Bluff too deep and heavy for casual reading. B. Bluff has superior distribution channels to keep its supply always well stocked. C. National Finals Rodeo in town — not huge John Juanda fans. 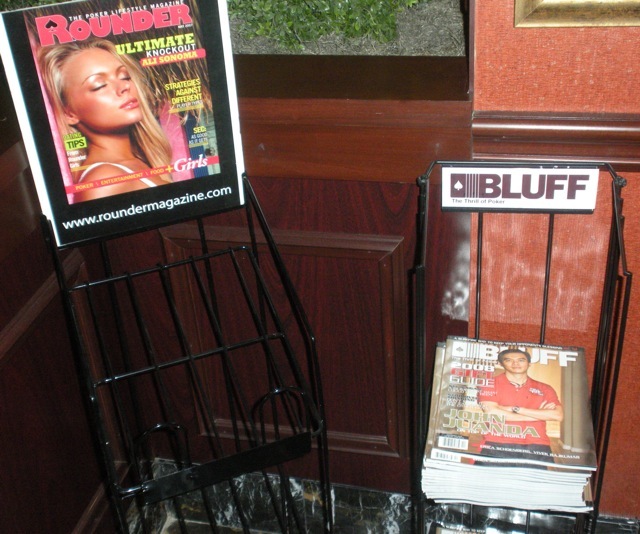 D. First issue of Bluff with an article by Dan Michalski. E. Rounder has a better rack. Well I’m sure it was that there was an article by Dan Michalski. It could have also been it was the the first issue with the Holdem Radio ad. I guess I will have to go back ad read your article. Was it any good? what was it about? Hey a better Idea, Can you post it here I’m just to lazy to go look for the Magazine. I heard “All In” has gone to poker mag heaven. Interesting … it looks like their website — http://www.allinmag.com — hasn’t been updated since October, and their “current” issue available online is from July. Frankly, I’m not sure they ever got an issue out on time in their four years of existence. Bummer for Eric Raskin if what you say is true.